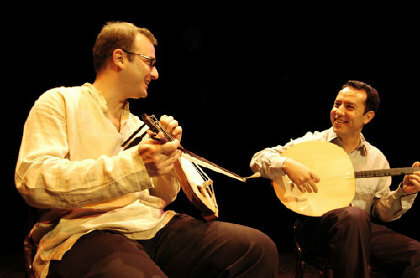 Ahenk, which means harmony in Turkish, represents the musical union of Murat Aydemir on tanbur (long-necked lute) and Derya Tuerkan on classical kemenche (3-stringed Turkish fiddle). 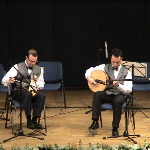 The Ahenk Duo performs well-known works of Turkish music by such masters as Tanburi Cemil Bey, Udi Serif Muhittin Targan, and Tanburi Necip Guelses. 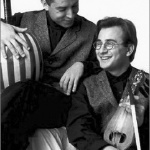 Their performances also include solo and joint taksims (improvisations) in various makams. 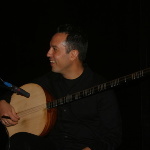 Murat Aydemir is best known for his work with Incesaz, a groundbreaking trio performing new interpretations of Turkish popular and classical music. 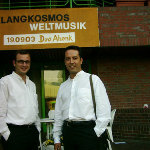 Aydemir has performed with the prestigious Ministry of Culture's Government Ensemble and Classical Music Chorus in Istanbul. 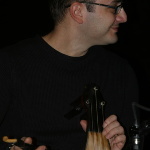 Derya Tuerkan is a master kemence (kemenche) player whose musical life is dedicated to Tanburi Cemil Bey. Derya Turkan is equally proficient in improvisational playing and the Ottoman & Turkish classical music and traditional repertoire. Also a member of Incesaz, Tuerkan has performed around the world alongside such masters as Alaeddin Yavasca, Bekir Sidki Sezgin, Erol Deran and various prestigious ensembles.